10 cm H. 4 cm Diam. 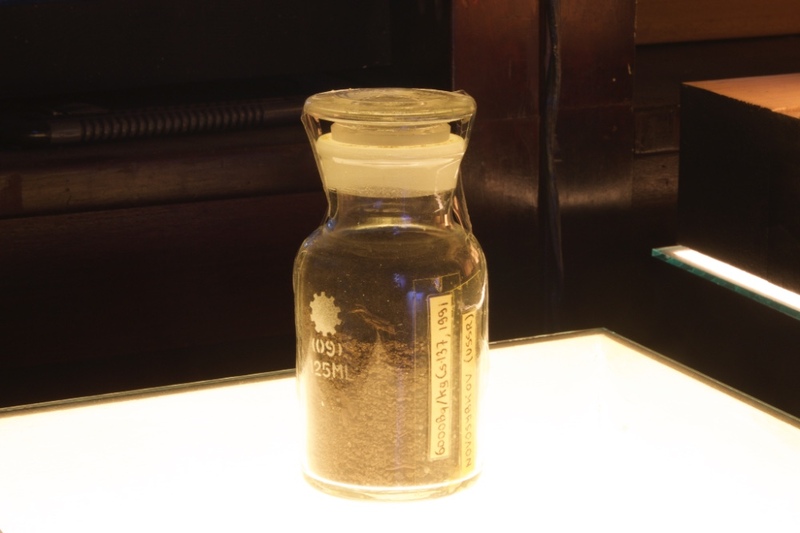 : soil, Cs-137 and other radionuclides, glass, paper. As a result of this explosion a cloud of radioactivity passed over large parts of Europe and the fall out of radioactive material contaminated about 200.000 km2 i.e. 2 % of its land. In 2005 the World Health Organization concluded that the accident resulted in some 50 deaths in the immediate aftermath of the explosion and a further 4000 pre-mature deaths expected to follow in the decades thereafter. So far the scientific, quantifiable effects of the accident, which do however not tell the whole story. What is more difficult to evaluate are the psychological and mental effects of the accident. These effects were found to be deeply traumatic for hundreds of thousands of people, leading to a paralyzing fatalism. Such effects are difficult to describe scientifically and require a writer such as 2015 Nobel prize winner Svetlana Alexievich. In her book “Chernobyl Prayer” (1997, Moskow, later revised several times in translations with different titles.) she carefully composes a collage of human voices that echoes all conceivable experience and that, according the Nobel Committee, deepens our comprehension of the overall human drama resulting from the Chernobyl accident.